Poultry Heaters – The “Eurochick” Poultry shed heater responds to the growing breeders requirements to have a warm air heating systems with clean “combustion free” air for their poultry shed heating . The increased power of 130 kW input (120kW Output ) compared to our “FATLE” Poultry heater range, provides the advantage of potentially using less heaters for each poultry shed . Along with the other advantage of requiring no or less ventilation to assure air renewal to the poultry shed thanks to the indirect heat exchange technology with obvious advantages from the point of view of efficiency and energy consumption.This Poultry heater has an efficiency of 92% , and is available with a LPG or Natural Gas Burner or an Oil Burner , to suit your Poultry heating system requirements.The installed heating capacity, and fuel consumption of our indirect Poultry heaters is typically 25% lower when compared to a direct fired poultry heating system, resulting in lower capital cost and more importantly, lower fuel costs year after year. 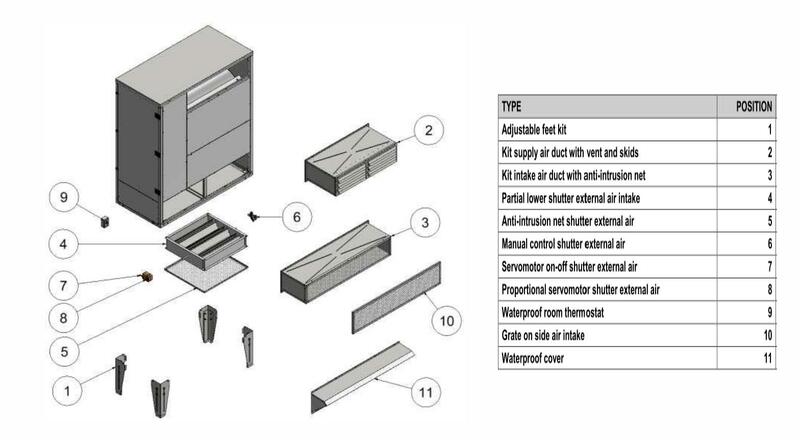 The totally sealed combustion chamber reduces excess humidity in the environment, and eliminates completely the supply of CO2, CO and NOx resulting from the combustion process, reducing the need of ventilation and ensures a healthy growth environment for animals. The combustion chamber and smoke tubes of Eurochick Poultry Heater are entirely made of stainless steel AISI 430. 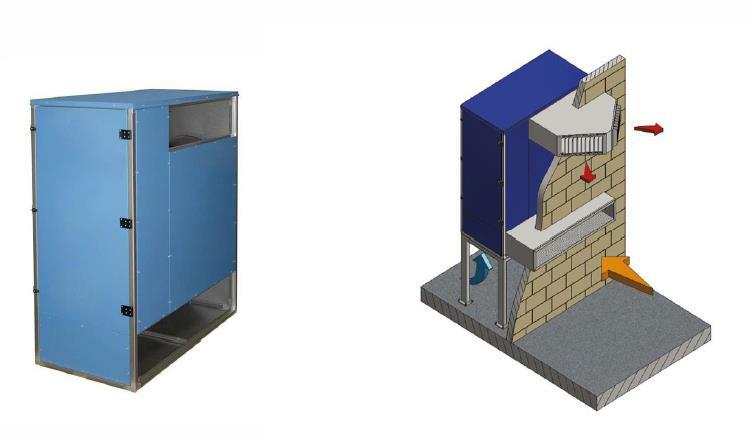 These Poultry Heaters can be installed outdoors without any additional protection saving precious inside spaces for breeding.The combustion is made with a blown burner: extremely reliable technology that ensures a stable operation of the warm air heater even in the most demanding conditions. The adoption of this technology allows the use of gas and oil burners without any need to modify the product , allowing the customer / breeder to select his or her preferred fuel. The problem with Direct fired Poultry heaters is – Direct Fired means that all produced combustion gases end up inside the building. 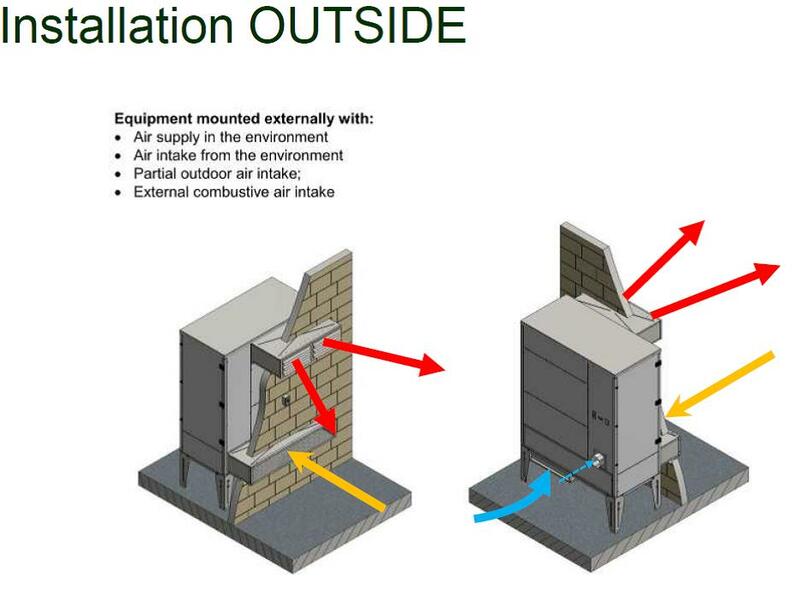 It is a necessity to have a minimum ventilation rate to eliminate these gases in order to maintain a healthy climate for the birds ,That means additionally energy costs ! In the above picture, you can see the Poultry Shed Heater , installed externally to the Poultry Shed / House. Making the Heater easily accessible for service during a crop cycle as the heater is installed outside the poultry farm. The risk of contamination is therefore reduced, and with bio security playing a much more important requirement for the breeder, an external poultry heating system provides a great solution for this. Any removal or winching the heaters for cleaning , as with some other types of suspended poultry heaters is unnecessary as the heaters are installed on the external wall of the poultry farm. 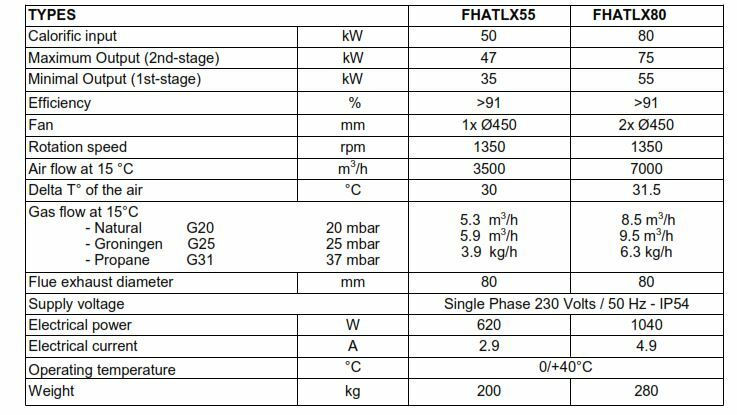 New for 2019, is what can be classed as the best poultry gas heater range on the market at present, designated the Flexiheat Indirect Gas heater “FHATLX” range. These poultry gas heaters are indirect combustion gas heaters specially designed for livestock buildings such as poultry houses. 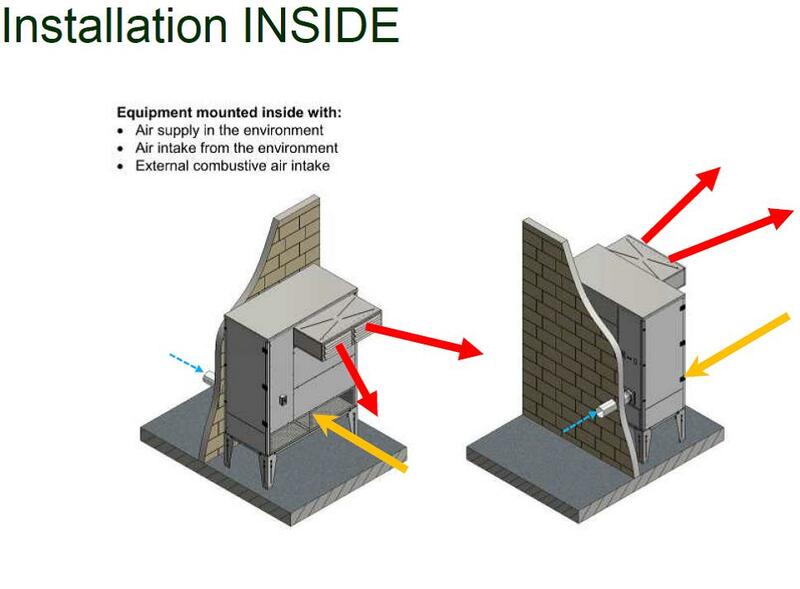 They can reduce energy consumption by up to 20%. Its closed combustion system prevents against CO2 emissions inside the poultry house, which reduces the necessity of ventilation and improves the environment inside the farm. This range of poultry heating equipment, is the only ErP (Energy Related Product) that we know of on the market, in the UK and Ireland. The benefit of this gas indirect heater range, is the Hi / Low burners that the heaters have. As most heaters spend the majority of the time only requiring a low output mode, these poultry gas heaters, which have been specially designed as gas heaters for poultry farms, can result in reduced energy consumption up to 20%, an important factor when considering a poultry heating system. This cost saving will have an important bearing on the bottom-line profit on any poultry farm business. This range of poultry indirect gas heaters can only be installed external to the building, which is a benefit when you consider bio security, as the heaters can be serviced without the need to enter the poultry farm. This range of indirect gas heaters also has another application to which it is well suited, that being greenhouse heating. 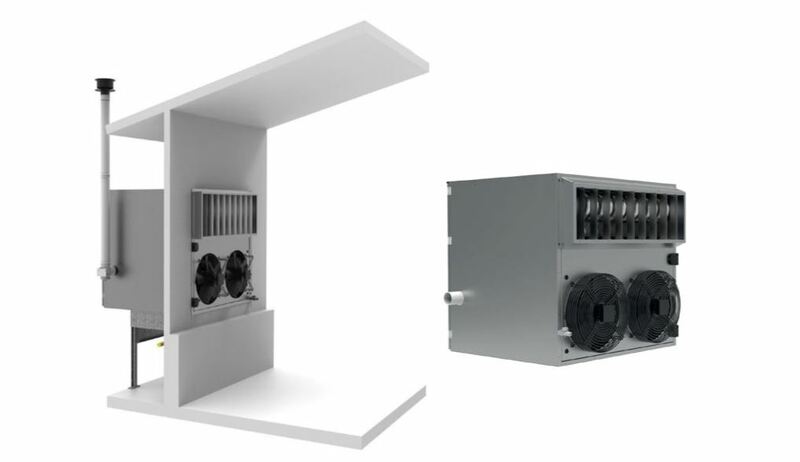 There are two heaters in this range, designated the “55” model – which has a maximum output of 47 kW and a minimum output of 35 kW or the larger model designated the “80” model, which which has a maximum output of 75 kW and a minimum output of 55 kW. 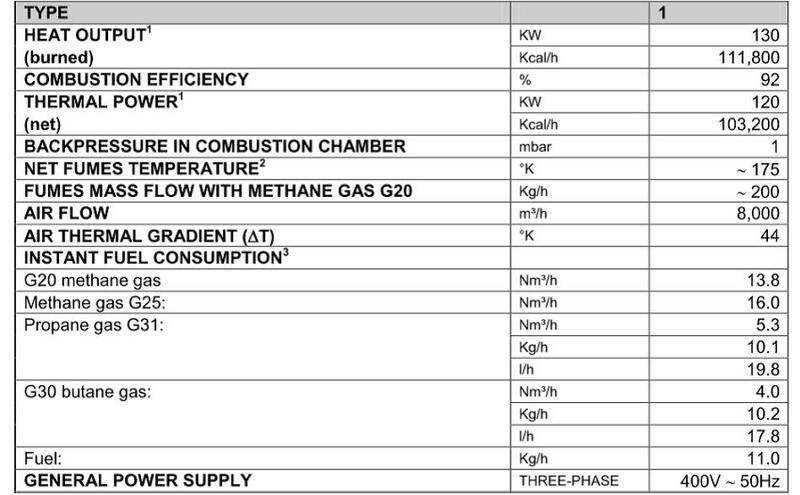 Both of these poultry gas heaters, can be fuelled by either LPG ( Propane Gas -Class G31 ) or natural gas ( both Class G20 & G25) only, and is not available in an oil fired version. The critical temperature for layers is 20°C. For every 1°C lower than 20°C, the birds require an extra 1.5 g of feed per day. The most efficient temperatures for layers are between 20 – 24°C. When temperatures rise above 24°C, shell quality and egg weight will reduce. The critical temperature for broilers and rearing birds is highly dependant on age. The recommended house temperatures for poultry are given in the following table. So what we require for you to do a full heat loss calculation , is what type of poultry farm you have , and if you farm is used for layers or broilers, then we can select the correct temperature for you poultry farm heating system , sizing it so that it can produce the right temperatures for the chicks , from the first day until the fourth week.